Tony Pence is a singer and song writer who lives and plays in Kentucky. A Carter City native, Tony has been writing songs since the early 1980’s when Aleta Roe recorded “Don’t Say You Don’t Love Me,” a song that garnered significant airplay in the tri-state area of Huntington-Ashland-Ironton during that time. After a hiatus of 18 years or so, Pence assembled Unforgiven, a band that would provide the foundation of Big Ugly. 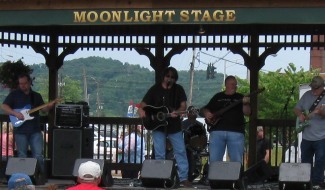 Over the years the Big Ugly Band opened for national acts such as the Kentucky Headhunters, T. Graham Brown, Confederate Railroad, among others. Two recordings came from those years, Someone I Used to Be, a seven song session of original material was recorded at Steve Hoffman’s LandMark Studio in Chesapeake, Ohio with Barton Stephens engineering and playing keys. That release followed with Live at the Shrine, a recorded Live performance in Ashland, Kentucky. The Someone I Used to Be project led to the radio release of the title cut, and Jack and Thelma, a song written for the birthday of Tony’s Grandmother, Thelma Pence. Both songs charted on CCMA radio with Jack and Thelma reaching number 4 in the US on Christian Country Radio, and both tunes reaching the top twenty under the same genre in Europe. The past couple years Pence has at times fronted a local cover band, The Sneakin Deakins, but working primarily again with Big Ugly as Stan Dixon has re-entered the music scene to a degree providing a quintessential element of the bands particular sound. A new recording project is currently underway that will present songs written primarily by Fred Brown, Jr., and engineered and arranged by Guitar Maestro Glen Ginn at Ginn’s Electric Ledge Studio. Long time band mates from Big Ugly have begun to reassemble in anticipation of presenting this new recording as well as several other new songs written by Pence, Brown and other tenured songwriters, HarpMan Stan Dixon and Clint Land (Someone I Used to Be). Tony has been published since 2006 by Joe Meador’s Grand Entertainment/Grand Haven Music, Inc. in Nashville, Tennessee.